Indeedy Musical Bingo makes for a boombastic corporate event. We’re a fun, fresh approach to team-building, client entertainment, and rewarding staff for working hard. The perfect antidote to the cliché company party, our addictive competition will liven up even the most reserved guests! We proudly have a 100% happiness track record with our corporate clients, who book us on a regular basis. Our show can also feature a team-based competition. Teams can be selected in advance or grouped randomly at the start of the event. Together, each team competes for points earned by bingo wins, dance-offs, air guitar competitions, and lip-syncing. It gets very competitive, and very hilarious! 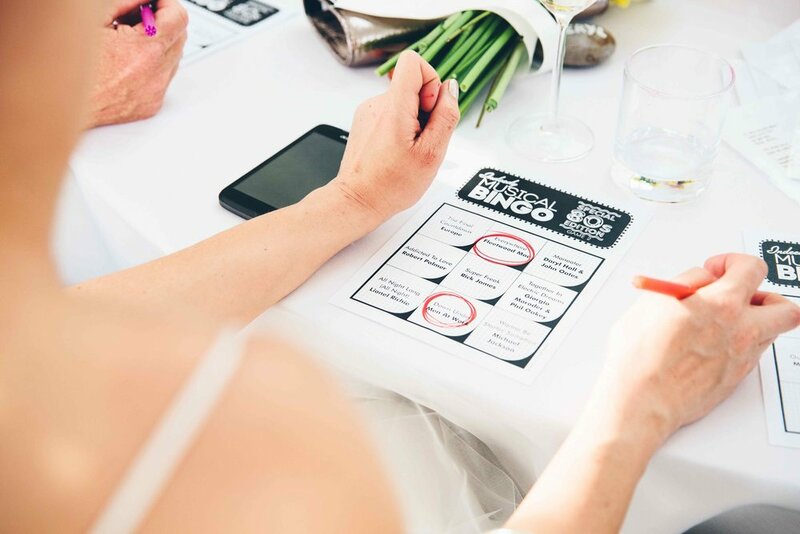 We’ve put on our fun Indeedy Bingo competition at weddings in all sorts of settings, from historic stately homes in Yorkshire, barn parties in West Sussex, to even a castle in Dorset! Celebrating a milestone? Put your party in good hands with our addictive competition! There’s nothing better than being surrounded by your friends and family with good music, lots of laughs and some competitive spirit. We’ll make your event unforgettable! We’ve celebrated birthdays and anniversary events with a wide age range of bingo-lovers, from little kids to 75-years-young. Our music is full of crowd-pleasing classics, and everyone can grasp the concept of bingo. Throw in some glitter, dancing, and hilarious prizes, and you’ve got a party of epic proportions. Bonus - it’s a great way for people in your different friend and family circles to get to know each other! Email us for more info and a quote.